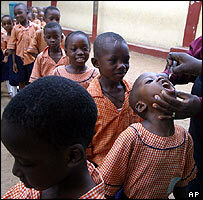 Nigeria is fighting a rare outbreak of a vaccine-derived form of polio, says the UN's World Health Organization. It says 69 children in the north have caught the paralysing disease from others who had already been immunised. The WHO says such rare outbreaks have occurred where immunisation campaigns did not reach enough of the population. In 2003 Islamic leaders brought a temporary halt to the vaccine campaign in the north saying it was a Western conspiracy to sterilise Muslim women. The WHO says this rare outbreak of vaccine-derived polio demonstrates the need for more vaccination, not less. But the concern is that the cause of the outbreak could be misinterpreted by people here and reinforce their scepticism of the whole vaccine campaign. The WHO says the outbreak occurred when some of those who had received the oral polio vaccine excreted a mutated form of the virus which infected those who were not immunised. It says the outbreak is ongoing but slowing because of the continuing vaccination campaign, and the last reported case was in August. The WHO says the outbreak occurred because not enough people were receiving the polio vaccine in the first place. Northern Nigeria still has a low coverage rate for the vaccination campaign, a legacy of a temporary halt to the programme in 2003. Those scare stories built on existing traditional scepticism of Western medicine. But more recently the vaccination programme has made some progress. Polio cases as a whole are down on last year, in part because of a new programme of polio victims accompanying immunisation teams to demonstrate to parents the risks of not having their children vaccinated.